Whether your door system uses torsion or extension springs, you'll want to check them regularly to ensure their condition isn't degrading. These powerful coils contain an enormous amount of tension, which causes them to go through a lot of wear and tear. When a spring breaks, the results can be catastrophic, as it can whip around and seriously injure anyone standing nearby. There are two variations of these components. The type you have depends the weight of your door and the backroom and headroom availability inside your garage. Extension springs work in tandem with one another, and they are installed in pairs, one on each side of the door. They contract to help the door open and stretch to help it close. The second variation is the torsion spring. It is installed above the door, horizontally, and twists and unwinds to raise or lower it. Usually, only one unit is needed, but this will depend on the size of and weight of your panels. Most residential systems don't require more than one torsion spring. Garage door springs have a tough job to do, which is why they need regular maintenance, and when necessary, they should be replaced, preferably before they actually break. These components need to be in what you might call tip top shape, so as to avoid the risk of them hurting someone in the event that they do break. Our fully trained technicians will lubricate these components for you and make sure their tension is properly adjusted so that they won't overstrain themselves. This will help them work more efficiently and reduce the wear and tear damage they suffer on a daily basis. 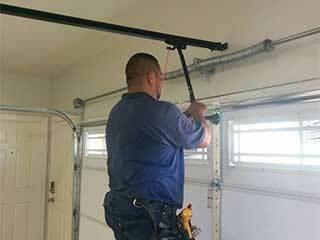 With all due respect to your DIY skills, you should never attempt to replace a garage door spring on your own. Without the necessary tools and the know-how and skills required to do this, you run the risk of making things worse, and potentially even harming yourself or anyone else that's standing close by. We strongly advise that you call our team at Garage Door Repair Alpine, to get our experts to take care of any spring replacement or maintenance you need.